PARIS (AP) – Rescue workers in dinghies cruised flooded streets on France’s Atlantic coast Monday, searching for people still trapped in their homes by storms that smashed through concrete sea walls and killed at least 62 people across Western Europe. The storm, called Xynthia, blew into France early Sunday with hurricane-force winds, flooding ports, destroying homes and leaving 1 million households without electricity. It also battered Belgium, Portugal, Spain and parts of Germany and snarled train and air travel throughout the continent. President Nicolas Sarkozy toured the worst-hit areas Monday, the coastal regions of Vendee and Charente-Maritime, and pledged €3 million ($4 million) in emergency aid. Regional officials clamored for France to quickly reinforce its aging sea walls. About half the French death toll of 51 was attributed to the breach of the sea wall off the coastal town of L’Aiguillon-sur-Mer, known for its shellfish farms. Aerial photos taken near L’Aiguillon-sur-Mer showed scores of houses in water that nearly reached their red-tiled roofs. Floodwaters also submerged streets in L’Ile de Re, a chic resort island of colorful ports, charming cottages and bike paths. Broken-off concrete blocks from a shattered sea wall lay strewn about one of the island’s beaches. The spokesman for France’s emergency services, Lt. Col. Patrick Vailli, said nine people were still missing and scores more were wounded. Dozens of neighborhoods were under water, and hundreds of houses were destroyed or damaged. The storm also caused six deaths in Germany – including a 2-year-old boy who drowned after he was blown into a river. Three people were dead in Spain, and Belgium and Portugal had one fatality each. France’s railways had major delays, and cancellations continued Monday at Frankfurt airport – one of Europe’s most important hubs. 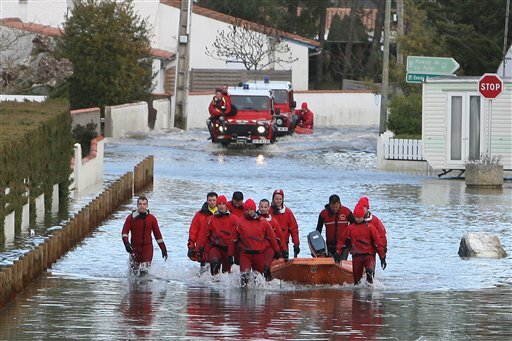 In the southwestern French town of La Faute sur Mer, firefighters evacuated stranded residents by boat Monday and car roofs just peeked out above the floodwaters. Sarkozy flew over the worst-flooded areas and met with residents in L’Aiguillon-sur-Mer, promising to quickly channel recovery funds. Sarkozy asked the interior and ecology ministries to draw up a report on what happened and submit it to him within 10 days. “We have to ask how in France, in the 21st century, families can be surprised in their sleep and drown in their homes,” he said. One official noted just how old some sea walls were. “The sea wall that broke dated from (the era) of Napoleon,” Philippe de Villiers, a far-right politician who heads the regional government in Vendee, told France-Info. “Either we build (new) sea walls, in which case they need to be taller and taller … or we have to build further” inland. In Portugal’s Azores islands, a mudslide swept a school bus off a road and into a ravine, killing the driver and sending two children, aged 10 and 12, to hospital. A 10-year-old girl, the bus’s only other passenger, was missing, officials said. The Azores islands lie 900 miles (1,450 kilometers) west of mainland Portugal in the Atlantic Ocean.